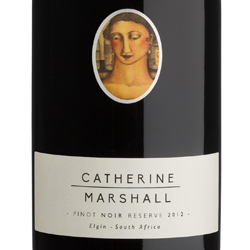 Catherine Marshall Wines is an Independent Wine Company producing hand-crafted, premium wines in the Elgin Valley along the Cape South Coast. Our vines grown in cool climate conditions, produce intense, bright, pure and fresh wines of character. Mouth filling red berry core and a fine, elegant and subtle fruit structure supported by well integrated mineral oak tannins. The focus is on complexity, restraint and harmonious balance by the careful selection and blending of clone and soil diversity within the cool Elgin area. Emphasis is on maximising layered flavour spectrums balanced with seamless tannin extraction. This is achieved by a minimalist and natural approach with attention to the integrity of the variety.